Morale was sagging around three in the afternoon on Saturday in a back room of the Model Gallery. After three days of labour, there were still balloons to blow up, still beds to be made. The three design students from IT Sligo persevered. They had to. The doors would soon be opened on the gallery and lodgers would be arriving for Dorm, the new Model's virgin exhibition. The inflated balloons were tied in rows on long rectangular strips of cardboard and became makeshift mattresses for Dorm's dormers. There were at least 6,016 balloons blown up in total. Such was the specificity of effort that went into creating a memorable christening for the brand-new, re-opened Model. There were about 80 beds on offer and the novelty of waking up in a gallery meant that overnight attendance was at capacity well in advance of the opening. While the evening predictably petered out as bedtime approached, anyone who spent the night in the Sligo gallery was treated to an enjoyable mix of the unexpected and the bizarre that you would expect from any good housewarming. I had been reading about the opening of €46billion World Expo in Shanghai on a flight over from Stockholm on my way to Sligo - with its banal ‘Better city, better life' theme - and it made me feel doomed about the future of mankind. Dorm co-curator Mags Morley employed a roughly similar ‘World's fair' theme in putting together Dorm, but swapped nations for independent art collectives from all over Europe and North America (though, it must be said, the Slovenian collective IRWIN exist within NSK, a larger art group that have declared themselves an autonomous state). I'm not sure I felt any better about the future after Dorm, but it was exciting to see a gallery space so animated on opening night. A playful radicalism thinly binds most of the work at Dorm and one hopes it will become part of the gallery's firmament. I encountered a breathless Thierry Geoffroy in his exhibition space just after he had conducted one of his Critical runs. An oval of sweat had formed between his shoulders and he wore a pair of runners with slacks. A just-showered participant sat on a chair in the space and combed her wet hair. On the wall, videos of a recent runs in Sligo and Paris looped. Geoffroy's project, where he holds and films discussions on topics like ‘Are art institutions so successful they no longer serve local artists?' or ‘Are the local emergencies the same as the global emergencies?' while jogging. It is a mix of Athens and Sparta, the philosophical with the athletic. He invited me to join in a jog the next day. 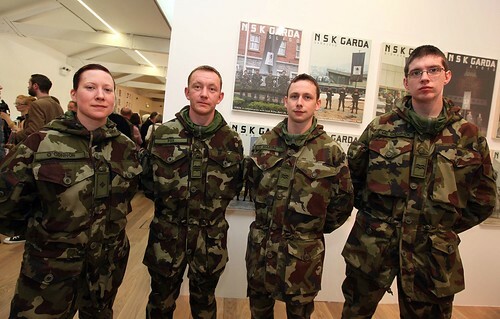 Down the hall, the four young Irish soldiers who took part in the IRWIN project stood beside a television rather bemusedly. A video played showing them pledging temporary allegiance to the NSK state. Nearby, a group gathered around a car muffler that French Canadian group BGL had converted into a houka pipe. Smokers were asked to exhale into an extraction fan. 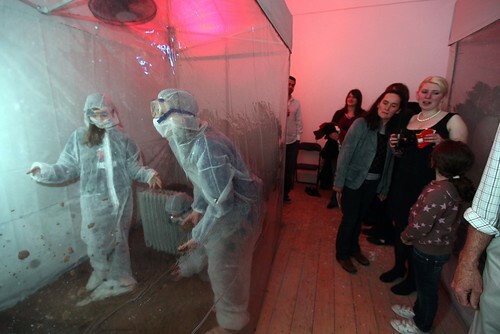 Austrian collective monochrom installed a heated lab in the gallery and treated participants to a climate-change workshop. There were also gigs in the performance space and performances in the gallery space that ran deep into the night. To add a meta element to proceedings, Dorm also commemorated the formal opening of the new Model. Sligo now has an art space that can stand alongside any other in the country. I couldn't help but feel a tinge of nostalgia as I entered the space. We live in a new era of austerity and it will be a long time before places like Sligo receive €6m to revamp a gallery. Sometime after 2am, after the beds were stretched out, I saw a skinny guy pick up a microphone, coat himself in Buckfast and strip down to a pair of long underwear. I don't know if this was an arranged performance, but it seemed to signal a sort of end to the festivities. I did not sleep on the balloon beds but I lay on one long enough to know that they are comfortable and give one an appreciation for the durability of helium. Donald Mahoney is a writer and journalist currently based in Stockholm.